What a day, dear readers! I went out for lunch (pizza!) with one of the Finnish teachers living in the same hotel/dorm as me, and I tried another yummy warm drink traditional to this region of the world– although this time I knew what I was getting myself into, unlike with the sbiten’. This one is called a glitveyn, and apparently they drink it in winter in Scandinavian countries and Germany and here in Arkhangelsk. It’s mulled wine. After lunch we met up with the Norwegian girl, and we all went to a museum in town with a contingent of Russian teachers intent on showing us the town. It was a lovely outing. The museum is called the Osobnyak, or Palace, on the Embankment. I did not take any pictures there, because it costs 20 rubles PER PICTURE. The three of us non-Russians also had to pay a higher price to get in than the Russian citizens. The museum was nice and well-kept, but not terribly interesting, although I did learn that it was popular to paint men’s studies green at the end of the 1800s. After the museum, the group split up, and Elena and I went on an EPIC adventure. (Elena is the woman who’s been my contact person since the beginning, and I’ll be working with her classes starting next week). 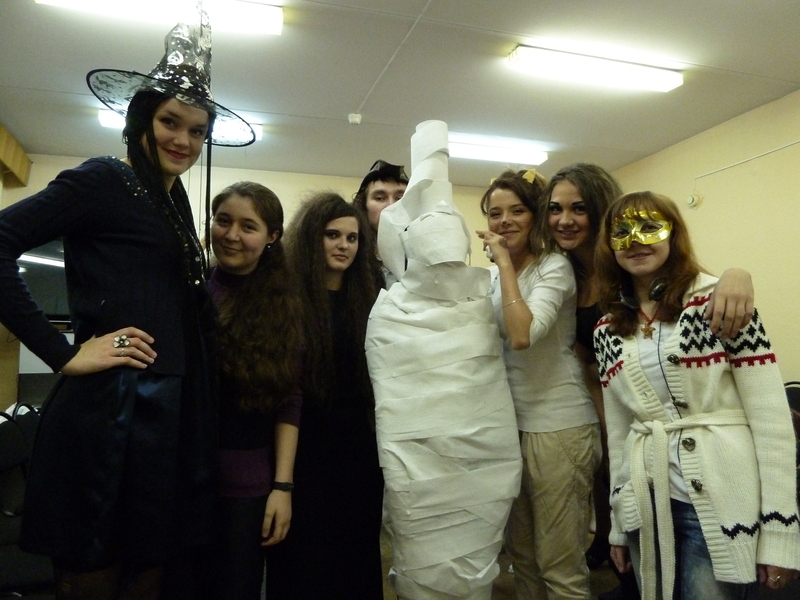 So Halloween is fast approaching, and I have promised a Halloween party as the first meeting of the American Club. And for a Halloween party, we must have a pumpkin! Elena and I went to one grocery store, then took a bus to another, walked through an outdoor market, to a third grocery store, got lost, went to two or three more grocery stores, asking at each one. We found pumpkins that looked like melons, melons that looked like pumpkins, little oval pumpkins, things that looked like squash but were labeled “pumpkin,” one pumpkin that was enormous and a horrible grayish green, and finally one that might do, in a sort of mottled grayish orange shade, but it had some deep nicks in it, and Elena insisted that we must have an unblemished pumpkin. So, the search continues. Elena left for home, and I continued on to the dorm, but I stopped at one last store on my way, wanting to buy juice. But what I found there was so much better than juice! I know this would be a lovely circular narrative if I were to find a perfect pumpkin, but alas, things don’t work that way in Russia! No, I found MARSHMALLOWS! 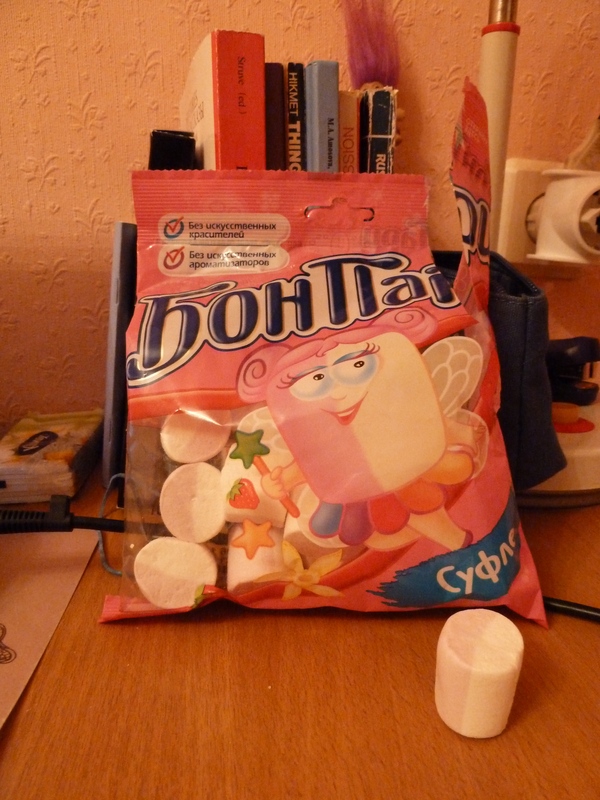 After spending a good $25 on real American marshmallows in Moscow, here in Arkhangelsk, tucked away in a box underneath one of the candy shelves, I found a bunch of bags of marshmallows. They’re not quite the same texture as American marshmallows, and they are strawberry-flavored, but still! I never thought I’d find such a thing here!